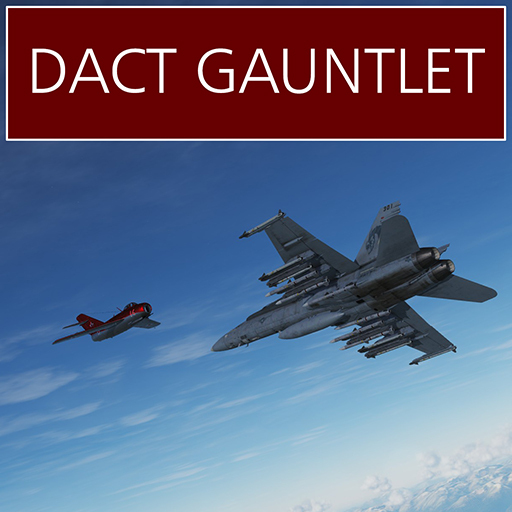 This is Dissimilar Air Combat Training (DACT) against a gauntlet of various fighter types. As you splash each one, a new opponent will spawn to engage you. There are 12 levels to this mission; can you make it to the end? You have a full gun load and six AIM-9X and six AIM-120C. An E-2D Hawkeye is on station to provide you datalink to help locate each adversary. The A/A Waypoint/Bullseye is at your starting location (waypoint 0). As always, thes missions of the week will later be added to the game. An operation is underway to reduce the enemy defenses on the approaches to Cherbourg. Strongholds are being targeted using both air and land assets to prepare the way for a final ground assault. Your flight of two F/A-18C, callsign Springfield 1, will be on call to destroy targets as directed by forces on the ground. Your flight will depart from the carrier and fly southwest to the target area. You will hold at Initial Point (IP) Adder, waypoint 2, and check in with a JTAC, callsign Axeman, on radio channel 5. Your target is expected to be enemy bunkers near the approaches to Cherbourg. The JTAC will direct your flight onto the targets when you arrive on the scene. Your flight is armed with both laser and IR guided AGM-65 Mavericks. The JTAC will mark targets visually with ‘willie pete’ smoke rounds and with a laser designator. Laser code 1688 will be in use. The target location will also be given as a bearing and distance from IP Adder, waypoint 2. See the mission planner for detailed navigation planning and the location of friendly air assets. Enemy units on the map can be considered current intel but may not be the threats you face during the mission. Other package elements will be airborne and operate on a common mission radio frequency. A flight of F/A-18Cs, callsign Springfield 4, be on station north of Cherbourg to provide suppression of SAM threats (SEAD) if needed. Their primary targets are mobile Roland SAM systems so you may be tasked to take care of shorter range Gepard AAA systems yourself if they become active. Combat Air Patrol (CAP) flights will be airborne to provide cover. Ford 7, two F-15C, will be on station to the west and Enfield 4, two F/A-18C will be on station to the east. Two F-14B, callsign Uzi 1, are also on station near the carrier. You may disengage and proceed in their direction for additional cover if needed. Hawk and Patriot SAM systems are active inland and should not be approached. Enemy aircraft can be expected to operate under their SAM coverage. See the intel slide to the left for details. Several different threat scenarios may play out and it may not always be possible to destroy the primary targets. Returning safely to base is the only success requirement.